Harmal: The Genus Peganum is an in-depth treatment of one of the most commanding plants in the botanical kingdom. Harmal: The Genus Peganum is an in-depth treatment of one of the most commanding plants in the botanical kingdom. Humble in appearance, modest in its needs, Peganum harmala has been venerated for millennia as a Deity-manifesting entheogen and a powerful medicine. This book traverses harmal's medicinal chemistry, its possible role in the origins of religion, and its employment from ancient times to the present in the therapy of patients suffering from infections, infestations, metabolic derangements, neurological degeneration, visual weakness, and cancer. Its peculiar indolic compounds, known as harmala alkaloids, are now appreciated as exerting profound effects on the mind and on the body. These effects are the result of the alkaloids' interactions with, and binding to, serotonin receptors on the cell surfaces of neurons in the brain and lymphocytes in the blood, the latter constituting the diffuse structural basis of the immune system. This biphasic modulation by harmala alkaloids has led to a novel pharmacologic re-visioning presented herein for the first time, the concept of a "lymphoneuric syncytium" and its possible long term tuning via "somatodelic" as well as "psychedelic" effects. The scientific rationale underlying the use of harmal in the medicines of the past and the healing technologies of our future is developed through exhaustive and meticulous explorations in both ethnopharmacology and modern phytochemistry. The presentation is enhanced through appraisals of the effects of harmal in two clinical cancer case scenarios, and of intentional inebriation and "provings" by one of the authors and a psychiatric colleague. The noted and esteemed botanically-trained physician Dr. Andrew Weil states in his Preface that this "monumental" volume will become the standard reference work in the field. 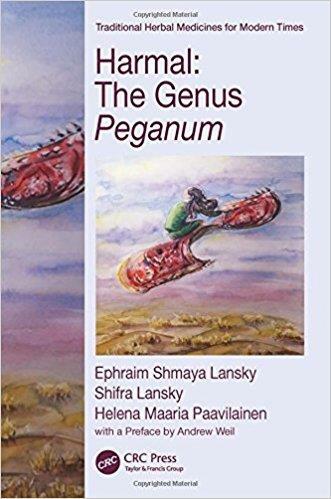 Harmal: The Genus Peganum will be an invaluable addition to the personal libraries of professional pharmacognosists, botanists, physicians, psychologists, neuroscientists, and all persons interested in the interrelationship of consciousness, medicine, and coevolution.